Yesterday's birthday celebration was probably the best I ever had. For the first time in my life I had all my best friends in one place. Usually at least one person is away or busy doing something else, but this time, I had luck on my side. The evening started with Korean BBQ in Korea town and ended with boba at Marlon's condo. It was a very enjoyable experience. During the night I kept thinking about how lucky I was to have the friends that I have and how much each of them have contributed to my life. I actually almost started to tear because I was so happy. My friends are one of the main reasons why I am the man I am today and I am sure I would be less of a whole person if it were not for them. Since I am writing about my birthday, I feel that I should mention my reflections on how I lived my previous year. The decisions that I have made in the past 12 months could be described as wise. I certainly do not regret any of them even though a few did not lead to the results that I had hoped for. For example, I do not regret having done all that research for my book even though I did not end up writing it. It was because I read all those texts that I learned more about political theory in this past year than I had all the years prior. A goal not attained is not effort wasted. The same could be said of my decisions regarding cradle to cradle. Even though I did not end up working for the Institute full time, I definitely do not regret choosing to move up there and meet everyone face to face. It was a priceless experience. Furthermore, I am certain that the connections that I made there will benefit me in the future. All in all, I have to say that I am happy with how I lived my 25th year. We, as a people, have been experiencing a horrible phenomenon for the past half century. The social networks that once bonded us together, the familiarity that once gave meaning to the word 'community' have been slowly decaying. Indeed, the strong social cohesion that once characterized the American society is no more. We have become a nation of separated individuals. To raise awareness of this issue and explain why it is dangerous is the purpose of this paper. The fact that our communal bonds have been weakening has been pretty well established. By looking at political participation, civic involvement and informal social connections, we can get a good sense of the health of our social networks and fortunately, this work has already been done for us. According to Robert Putnam in his groundbreaking book Bowling Alone: The Collapse and Revival of American Community, there has been a decay in virtually every aspect of community participation and social engagement ever since the 1960s. We, as Americans, participate less often in politics,i community organizations,ii religious activities,iii and informal interactions.iv In other words, we are becoming more and more atomized. As to why this phenomenon has been happening, Putnam points to 4 factors: generational change, TV, sprawl and work. Generational change refers to the fact that people born after World War II are not as civically engaged as their parents. Putnam believes the fading effects of the war have something to do with that. TV refers to the increase of television viewing which has privatized our leisure time. Sprawl refers to the increase distance Americans have to travel on a regular basis. And finally, work refers to the pressures of time and money. Putnam assigns the following percentages of responsibility for each factor. Generational Change. The fact that Putnam believes generational change is responsible for half of our social decay is astonishing, but the facts are there. The older, more civically engaged generations are being slowly replaced by younger more apathetic ones. An annual survey conducted by UCLA of college freshman shows this change in values quite clearly. In this survey, students were asked to rate the importance of the following values: be very well off financially, keep up-to-date with politics, be involved in environmental cleanup, and participate in community action. In the late 1960s, almost 60% of students rated keeping up-to-date with politics as essential or very important. By the late 1990s, that percentage had gone down to less than 30%. Meanwhile, the exact opposite trend was observed with the importance of money.v In short, younger generations are more concerned about money and less concerned about the community. Sprawl. With the increase of traffic and growing distance between workplace and home, Americans are spending more and more time alone in our cars.ix As a result, we have been ignoring our civic and communal duties. In fact, Putnam states that “each additional ten minutes in daily commuting time cuts involvement in community affairs by 10 percent – fewer public meetings attended, fewer committees chaired, fewer petitions signed, fewer church services attended, less volunteering, and so on.”x Having said that, the time spent commuting is not the main reason why sprawl is so toxic to civic engagement. The main reason is that commuting “disrupts community 'boundedness. '” It is the actual fact of traveling to a different place that dampens our community involvement. An analysis of the impacts of work on our civic lives cannot be done without factoring in the increase of women entering the workforce. In the past, women bore a disproportionate share of the responsibility for community involvement so it would make sense that our social cohesion would be greatly affected by women having less free time. And this is true. For example, club attendance is lower among women who work full-time. On the other hand, full-time employment has enhanced other sorts of civic activities such as organizational membership. The cross currents in the data make the analysis a bit complicated, but once we look deeper into the details, we will notice again that civic engagement is better linked with financial pressure than busyness. Women who work for personal satisfaction are much more likely to participate in the community when compared to women who work solely for the money.xii In short, busyness, financial anxiety and the pressures associated with two-career families does seem to have a noticeable effect on weakening our social bond. Why does social cohesion matter? Social cohesion is important because it provides us with an indispensable tool to protect ourselves against the continual encroaches of unjust authority. Without the mutual support that we give one another, we are nothing but a collection of separated individuals, easily manipulated and oppressed. Just because we live in a democracy does not mean having the strength to stand up to authority is not important. For it is not authoritarianism that we need to be weary of, but of authority in general. This lesson of history could not have been more clearly illustrated than it was in the Milgram Experiment. The famous Milgram Experiment was conducted by Stanley Milgram in 1961 shortly after the trial of Nazi war criminals. The point of the experiment was to see if people (like the Nazi soldiers) would obey an authority figure even when they were instructed to perform an act that was clearly against their conscience. Unfortunately, as you will see, the majority of subjects could not gather enough internal strength to disobey. The experiment had three participants – an experimenter (scientist), a teacher and a learner. Both the experimenter and learner were confederates of the study, but the teacher, who was the real subject, believed the learner was also a volunteer. The teacher was told that the goal of the experiment was to see the effects of punishment on memorization. What the teacher had to do was give out a memory test by reading a series of words into a microphone. The learner, who was strapped to the end of an electric generator in another room, had to remember the words that were read to him, but if he could not recall the correct words, the teacher was to shock him with electricity. Each additional incorrect answer was to be punished by an increased voltage of electric shock. The experiment was designed so that the learner would make a number of planned mistakes to warrant the shocks. If the shocks were to reach a certain voltage, the learner would then start to complain about the pain. His complaints were to grow in intensity in accordance with the increase of voltage. However, in actuality, there was no learner in the other room at all; the complaints were all played back from a tape (the teacher was unaware of this of course). The true purpose of the experiment was to see if the teachers would continually administer the shocks even when they could clearly hear the learner's complaints. It should be noted that the complaints escalated to agonizing screams. The results of the study were astounding - 65% of subjects continually administered the shocks till the very end (450 volts). No one, including psychiatrists surveyed before the experiment, expected the extent of the subjects' obedience.xiii The lack of strength people have to disobey authority constitutes the main finding of the experiment. Even though many of the subjects expressed their reluctance to continue, they lacked the internal will to revolt. Another key finding of this study was discovered through a variation of the experiment. Instead of the three figure model with one experimenter, one teacher and one learner, there was to be three teachers, each assigned with a different task. One teacher was to read the words, the second one was to announce if the learner's answers were correct or not, and the third teacher (naïve subject) was to administer the shock. What the actual subject did not know was that the other two teachers were confederates. In this variation, the two confederate teachers were to protest against the experiment and ultimately refuse to continue. The first teacher was to protest and disobey at the 150-volt level shock. The second teacher was to do the same at the 210-volt level shock. The goal of this experiment was to see whether or not the disobedience of others in the subject's position would affect his behavior. And in fact, it did. Instead of the typical obedience rate of 65%, in this variation, only 10% of the subjects administered the final shock.xiv Of all the variations conducted in the experiment, none other was so effective at undermining the authority of the experimenter. 1. The peers instill in the subject the idea of defying the experimenter. It may not have occurred to some subjects as a possibility. 2. The lone subject in previous experiments had no way of knowing whether, if he defies the experimenter, he is performing in a bizarre manner or whether this action is a common occurrence in the laboratory. The two examples of disobedience he sees suggest that defiance is a natural reaction to the situation. 3. The reactions of the defiant confederates define the act of shocking the victim as improper. They provide social confirmation for the subject's suspicion that it is wrong to punish a man against his will, even in the context of a psychological experiment. 4. The defiant confederates remain in the laboratory even after withdrawing from the experiment (they have agreed to answer post-experimental questions). Each additional shock administered by the naïve subject then carries with it a measure of social disapproval from the two confederates. 5. As long as the two confederates participate in the experimental procedure, there is a dispersion of responsibility among the group members for shocking the victim. As the confederates withdraw, responsibility becomes focused on the naïve subject. 6. The naïve subject is a witness to to instances of disobedience and observes the consequences of defying the experimenter to be minimal. 7. The experimenter's power may be diminished by the very fact of failing to keep the two confederates in line, in accordance with the general rule that every failure of authority to exact compliance to its commands weakens the perceived power of the authority. Four apparent subjects appear at the laboratory to take part in an experiment on the “effects of collective teaching and punishment on memory and learning.” Three of them are confederates of the experimenter and one is a naïve subject. The experimenter explains that three teachers and one learner are to be used in the study, and by means of a rigged drawing, the naïve subject is assigned the position of teacher 3. the roles of teacher 1, teacher 2, and learner are filled by the confederates. The learner is strapped into the electric chair and the three teachers are seated before the shock generator. Teacher 1 is told to read the list of word pairs, teacher 2 tells the subject whether his answer is correct or incorrect, and teacher 3 (the naïve subject) administers punishment. As in the basic experiment, the subjects are instructed to raise the shock level one step each time the learner makes an error. Behavior of confederates. The confederates comply with the experimenter's orders through the 150-volt shock, which provokes the victim's first vehement protest. At this point teacher 1 informs the experimenter that he does not wish to participate further, because of the learner's complaints. The experimenter insists that teacher 1 continue. However, teacher 1 is not swayed by the experimenter's commands, gets up from his chair in front of the shock generator, and takes a seat in another part of the room. Since the experimenter's efforts to get the subject to return to the generator are futile, the experimenter instructs the remaining two subjects to continue with the experiment. 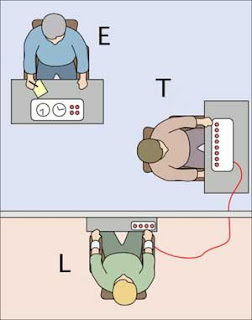 Teacher 3 (the naïve subject) is to handle the reading of word pairs, in addition to his regular job of administering electric shock to the learner. At this point the naïve subject is seated alone in front of the shock generator. He has witnessed the defiant actions of two peers. The experimenter orders him to continue, stating that it is essential that the experiment be completed.